In a small fishing village in the north of Lanzarote, you will find Famara, a sleepy paradise with some of the best surfing conditions in Europe. It doesn’t matter if you are a first timer or a surfing pro – the surf here ranges from gentle rolling waves to 3m high adrenaline fuelled breaks. 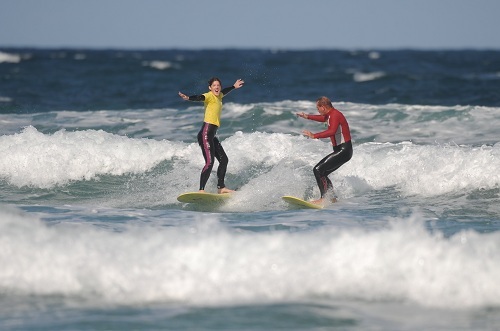 There is a choice of professional, fun surf schools – whether you want a full weeks’ worth of lessons or just don’t want to pay the budget airline fees for taking your own board with you and need somewhere to hire one. The surf in Lanzarote is best from November to March, where the storms from the Atlantic create exciting waves, and the water is still a hell of a lot warmer than it is in the UK! The average sea temperature is around 18C – 23C and the island boasts year round sunshine. You can surf here all year round however, so in the summer months remember your sleeved rash vests to protect you from the sun’s rays and in winter a 3/2mm suit should be fine – depending on how much you feel the cold! One of the best surf schools on the island is Surf School Lanzarote, a long established and reliable school, where you will find incredibly friendly and enthusiastic instructors who have years of experience. You can do everything from a one day refresher course, to a full week’s worth of beginner lessons, to advanced classes where you can perfect your style. Other opportunities in Lanzarote include ‘surfaris’ where you can board around the island and guides will show you the best spots and even provide transport. The beach at Famara is lifeguarded and they will be more than willing to tell you all about the rips and tides – just remember to check with them about the most current conditions as the flag system is not the most reliable here! Famara is not the most exciting place once the sun goes down and it is too dark to surf. For a bit more in the way of nightlife and things to do, stay in Costa Teguise or Puerto del Carmen, both only around 30 minutes away. Surf School Lanzarote even offer pick-ups and drop offs from these resorts if you pre-book lessons. Here you will find an abundance of hotels from self-catering apartments, to all-inclusive hotels. There are a wide range of restaurants and bars to suit every taste. Evenings can consist of live music and tapas or late night clubs – it’s up to you! The 6km beach here means that there is plenty of room for surfers to spread out, and the short four hour flight means that cheap holidays to Lanzarote are a piece of cake! There are long hours of sunshine, warm waters and stunning views to enjoy. So, escape the gloomy British weather, get some winter sun and either try out a new sport or test out a surfing patch that you might not have tried yet! 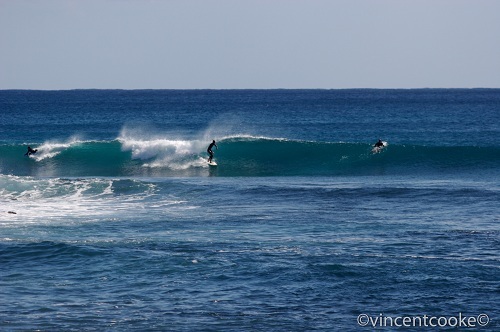 This entry was posted in Europe, Surfing, Travel, Water Sports and tagged Famara, Lanzarote, Surfing. Bookmark the permalink.